Impress your family and friends when you serve them a black bottom cupcake. These chocolate cream cheese cupcakes taste as luscious as they look. 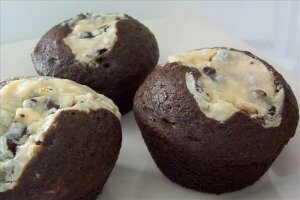 These rich chocolate cupcakes filled with cream cheese and chocolate chips do not need any frosting, they are perfect as is. This black bottom cupcake recipe makes a dozen moist cupcakes that are good for any occasion. Make your sweetheart a special dessert any day of the week with this easy recipe. 1. Preheat oven to 350 degrees F. Line muffin pan with 12 paper or foil cupcake liners. 2. In a medium bowl, combine cream cheese, 1/3 cup sugar and egg. Beat well with a wire whisk. Stir in chocolate chips. Set aside. 3. Sift together flour, baking soda, salt, 1 cup sugar and cocoa into a large bowl. Set aside. 4. In a small bowl, combine water, oil, vinegar and vanilla. Add this mixture to the flour mixture. With mixer on low speed, beat until well blended. 5. Spoon batter into lined muffin pan, filling each liner half full. Spoon 2 teaspoons of cream cheese mixture into center of each cupcake. 6. Bake for 25 to 30 minutes. Remove from oven and cool in pans for 10 minutes. Remove cupcakes from pans and let cool completely on wire racks.